Arizona’s forfeiture laws are so complicated that even lawyers often struggle to understand them—let alone the average person. People caught up in Arizona’s forfeiture maze face a system where each turn can lead to a dead-end. Property owners have only 30 days to either petition the prosecutor to reconsider the forfeiture or ask permission to go to court to fight back. But this process requires owners to file a sophisticated legal document with a lot of information—often without the benefit of a lawyer. If they miss the 30-day window or mess up the document, they lose their property forever. And most of the time, it is the prosecutor—not a judge—who decides what to give back and what to keep. Even worse, police and prosecutors get to keep 100 percent of what they forfeit, setting up a financial incentive to seize as much property and cash as they can. In fact, Arizona law enforcement seized more than $25,000,000 in 2017 alone. Two victims of this maze are Terry and Ria Platt, an elderly couple who had their car seized after police pulled over their son—who does not own the car—for a window tint violation. The police found cash and a small amount of personal use marijuana, both of which the son said were his. Even though Arizona law does not allow forfeiture of the car for having cash and a small amount of personal use marijuana, prosecutors tried to ignore the law and forfeit the car. Navajo County prosecutors used a procedure that turns prosecutors into judges to keep the Platts from having their day in court. After prosecutors started the forfeiture proceeding, Terry and Ria mailed in the paperwork to get it back before the 30-day window closed. But prosecutors told the court the paperwork didn’t count without giving a reason why or letting the court see the paperwork, and instead demanded the court give the car to the prosecutors’ office. Amazingly, Arizona law says that courts have to take prosecutors at their word when they demand “uncontested forfeiture,” an administrative proceeding where there is no judge, but rather a prosecutor who reviews petitions and decides whether to keep the property or return it. Arizona’s forfeiture maze is unconstitutional and this case is an example of precisely the sort of abuse that Arizona courts have warned about in the past. Arizona’s forfeiture scheme makes it too easy for law enforcement to take property from innocent owners while robbing them of their due process rights. That is why the Institute for Justice and the Platts filed a lawsuit to put a stop to “uncontested forfeiture,” bring Arizona’s forfeiture statutes in line with the requirements of due process, and win the return of Terry and Ria’s car. Shortly after IJ got involved, the prosecutors changed their tune and “voluntarily” returned it. And the Platts’ story helped convinced the Arizona legislature to eliminate a number of troubling features of Arizona’s forfeiture laws. But Arizona still allows “uncontested forfeiture” from those who have never been charged with, much less convicted of, any crime. So the Platts and IJ are continuing to fight in court to ensure the violation of Terry and Ria’s rights is recognized and so that this cannot happen to them or others in the future. 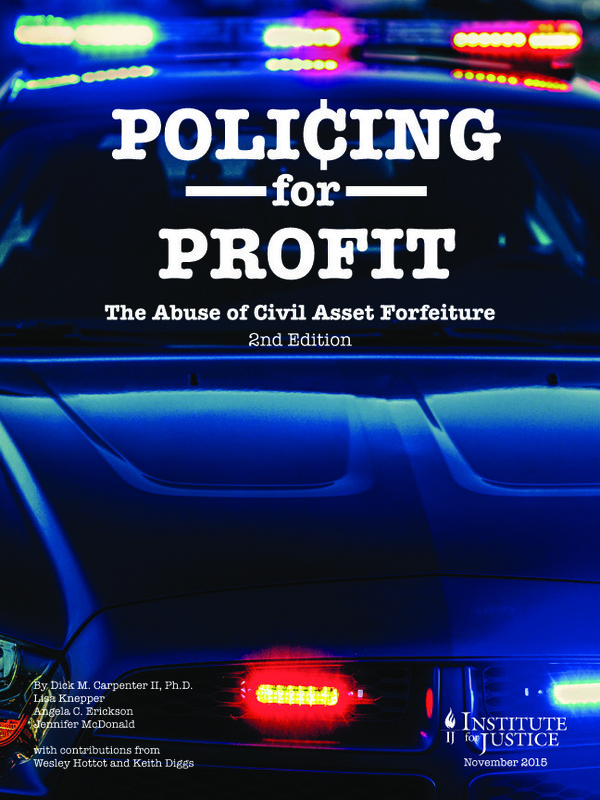 When the Platts found themselves ensnared by Arizona’s forfeiture scheme, Arizona had just earned a D- in IJ’s 2015 Policing for Profit study for having some of the worst forfeiture laws in the nation. Arizona law allows law enforcement to seize property often based on a showing of mere probable cause—the lowest standard of proof there is. When property owners mail in paperwork to claim their property, prosecutors can act like judges and throw out the property owner’s case without their claim ever being read in court. Exacerbating the problem, law enforcement officials can keep and spend up to 100 percent of what they forfeit. These laws set up a perverse financial incentive that encourages law enforcement to try to forfeit as much property and cash as possible and makes it incredibly difficult for innocent property owners to fight back. Victims are thrown into a maze of confusion that often leaves them without a way out. Using a process called “uncontested forfeiture,” prosecutors—not a judge or jury—would decide if Terry and Ria would get their car back. The Platts never heard back from the prosecutor about their petition. Instead, the government took a shortcut and filed an “Application for Forfeiture” in Navajo County Superior Court, claiming that “no timely claim or petition . . . has been filed or submitted relating to said property.” Although the government admitted receiving the Platts’ petition in time, the prosecutors told the court that their petition was “null and void.” The application didn’t say why, and the government didn’t give the court a copy of the Platts’ petition. In essence, the prosecutors demanded the court just take the government at its word. At no point did the government ever accuse Terry and Ria of a crime. The government’s argument was purely that four missing words disqualified Terry and Ria from getting their car back. This is a trap for the unwary and unrepresented that the government has been trying to use not only to take Terry and Ria’s car from them, but also to deny them their day in court. Arizona’s forfeiture statutes are complex, highly technical laws which even lawyers (to say nothing of ordinary people) often struggle to understand. Even though forfeiture seeks to take property from its owners, the owners are not a party to the forfeiture. Instead, to protect their rights and object to forfeiture, owners must either petition the prosecutor to reconsider the forfeiture or make themselves a party to the litigation by filing a claim. Either way, they must comply with a long list of technical requirements, including complex legal citations and mailing requirements, for their case to be considered.1 And they have just 30 days to provide this information. No discussion of Arizona’s forfeiture statutes is complete without mention of the profit incentive. Law enforcement officials—both prosecutors and police—have a direct and perverse financial interest in forfeiting property. The Attorney General and various County Attorneys, for example, control the proceeds from forfeited property.5 By law, these prosecutors hold the proceeds for the benefit of police agencies and the prosecutors’ office.6 These proceeds are then used for, among other things, paying salaries and other compensation for the very people who are working on forfeiture. This means that both police and prosecutors have an obvious financial incentive to take property through forfeiture, motivating them to win at all costs rather than pursue justice impartially. Magnifying all the constitutional faults of forfeiture is a peculiar system called “uncontested forfeiture,” the trap Terry and Ria unknowingly fell into: a system in which a prosecutor—who has a conflict of interest because he stands to profit from the forfeiture—also gets to act as the judge. “Uncontested forfeiture” is really an administrative forfeiture in which there is no judge. A property owner sends a petition to the prosecutor and the prosecutor determines whether forfeiture is allowed. Here, the prosecutor unilaterally declared Terry and Ria’s petition “null and void,” at first without any argument and later based on a hyper‑technical allegation of deficiency. The prosecutor then filed an application for forfeiture, which ordinarily prohibits the property owner from objecting to the forfeiture and grants the government a lower burden of proof, virtually assuring the property owner will be permanently stripped of his property rights. This is exactly what happens in “uncontested forfeiture.” The prosecutor, whose office benefits from and controls forfeiture proceeds, is given adjudicatory power to unilaterally reject objections to forfeiture. And worse yet, in Terry and Ria’s case, the prosecutor argues the courts are without power to allow property owners into the case to object. Repealed a “reverse” attorneys’ fee provision that allowed the government to stick property owners with expensive fees and costs, even when property owners won a case and instead now allows property owners, and not the government, to recoup fees if they prevail. Implemented new transparency requirements for forfeitures and oversight for forfeiture spending. Closed a forfeiture loophole in federal law by banning Arizona law enforcement from transferring or referring seized property to a federal agency, unless the property is valued at over $75,000. The 2017 reforms did not, however, address the two key issues in this case: the profit incentive or uncontested forfeiture. That is why IJ continues to litigate the case. “Uncontested forfeiture” violates the constitutional guarantee of due process by allowing prosecutors to usurp the role of judges and adjudicate proceedings in which they have a direct financial interest. The profit incentive conflict of interest renders the whole forfeiture scheme—more than just “uncontested forfeiture”—unconstitutional. As Terry and Ria’s case demonstrates, the incentive statutes motivate law enforcement to pursue and obtain forfeitures which have no basis in law. This deprives people like Terry and Ria of their property without due process of law in violation of the 14th Amendment to the U.S. Constitution and Article 2, section 4 of the Arizona Constitution. This case is being litigated by IJ Attorneys Paul Avelar and Keith Diggs. The Institute for Justice is the national law firm for liberty and the leading advocate for property rights. This case is the latest in IJ’s nationwide initiative to end civil forfeiture. IJ has successfully challenged civil forfeiture in Oklahoma and federal use of civil forfeiture in Massachusetts, Michigan, Iowa, New York and North Carolina. For more information on IJ’s national initiative to end civil forfeiture, visit endforfeiture.com.